Newlands Chapel. Kent Chapel Weddings. Newlands is a privately owned, Grade II* listed Medieval Chapel. Discretely situated in a peaceful and beautiful rural location, it is the oldest building in the picturesque village of Charing. The Chapel is steeped in history, decorated with ornate masonry and is renowned for its uniqueness, being mentioned in both ancient and modern literature. Having previously been veiled by trees and bushes, Newlands Chapel was a hidden treasure for many years. Ceremonies are now welcomed throughout the year and, being flexible in our approach, we delight in helping to achieve an image becoming a memory to cherish for ever. Whether you are looking for the simplest of weddings or one which is strikingly different, we offer a bespoke and personalised range of services to ensure your day is tailored to meet your exact requirements. 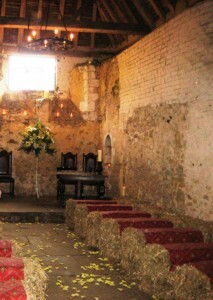 Newlands Chapel is suitable for the smallest of parties to a maximum of 70. We also host Corporate Events and Naming Ceremonies are welcomed. Please note: All photographs on this website are the property of Kent Chapel Weddings and may not be downloaded, copied or reproduced in any matter whatsover without the permission of the proprietors.